I've blogged in the past about my Travel Afghan. This has been an ongoing project for several years. Whenever I go on a trip I like to look for a yarn shop and I'll buy a ball of yarn in order to add another block to the afghan. I try to choose something that will remind me of the trip and the area that I'm visiting. It might be a yarn that is from that part of the country (e.g. Brown Sheep from Mitchell, Nebraska), a color representative of the area (e.g. southwest colors), the name of the yarn (e.g. Limbo, for when I was stuck in the Toronto airport during 9/11), etc. All but two were from my own trips. The exceptions are a block using the yarn that my daughter and son-in-law brought me from their honeymoon in Greece; and, yarn from my best friend's trip to South Africa. The pattern I'm using in the Rambling Rows afghan. I chose it, not only because it's one of my favorite patterns, but because there is no sewing together of the blocks. For each block you pick up the stitches and make a mitered square or rectangle. I've just finished blocks number 37, 38 and 39. I was behind, but I wanted to get caught up before I head out on vacation next month. Block #37 was a trip to my hometown, Kingston, Ontario in August, 2008. I said that I was behind in my squares! I was visiting my parents and while I was there the rain came through a hole in the roof (the hole was created by a family of raccoons). The rain caused the hardwood floor by the front door to lift and buckle. I extended my trip to help out with talking to the insurance company, contractors, etc. I chose a ball of brown yarn that was close enough to the same color (the yarn is a wee bit darker than the floor) as the hardwoods. 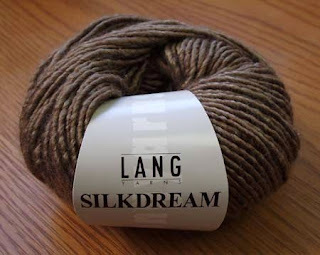 The yarn is Lang Silkdream, 50% merino wool/50% silk, is aptly named. It's beautiful and soft. Block #38 was another trip to my hometown, this time in May, 2009. My father had recently had another debilitating stroke and was living in a long-term care nursing home. He's still there. 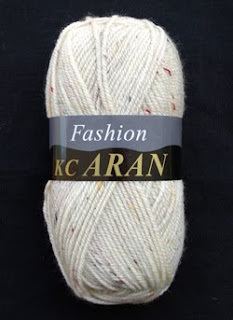 The yarn is Fashion Aran by King Cole. My maiden name is Cole and before my father had his strokes, his username on the computer was always King Cole. The yarn seemed like an ideal choice. It's 70% acrylic/30% wool, color #89 Granary. Even with the high acrylic content, I quite like it. The last completed square is for a short trip I made to Cheyenne, Wyoming for work, in May of this year. Even though I was only in the city for a few hours I had to check out a local yarn shop and I found Ewe Count. 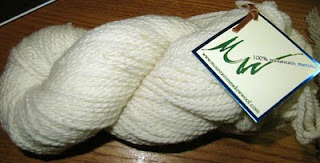 The yarn is a skein of beautiful undyed 100% mountain merino wool made in Buffalo, Wyoming. It's from the Camino & Sons KID Ranch, Johnson County, Wyoming. Not only was it from the area, but I'd never seen it anywhere before. I'd like to see it, in large quantities, again! Added 8.01.10 - I just picked up the Fall issue of Interweave Knits and this yarn is featured on page 12 in the "Yarn Spotlight". It feels good to be caught up at last. Now, I can go on vacation and bring back another wonderful skein of yarn and knit it into my afghan right away. By the way, there are 55 blocks in this pattern so it's going to be a while yet until this project is finished. I need to travel more so that I can complete it!! What a lovely story! Sorry to hear about your father, but I'm sure this afghan will have many happy memories. ooh, I'd love to see some of your blocks. I'm totally behind in knitting up my souvenir yarn too -- because I'm not making it into afghans and lately that's all I'm knitting is afghans.